Manufacturing and transportation cost inflation pressuring EBITDA. Costs may have abated to some extent in Q4 FY 2019. Strong volume growth required to achieve EBITDA targets. Population growth in Nevada, Texas, and North Carolina driving growth. Advanced Drainage Systems (NYSE:WMS) has had a good recovery in its stock price since touching a low of $23.24 just before Christmas. It currently trades at $27.64 or a gain of about 15.6% since its lows in December. But the company potentially faces headwinds in growing sales volumes and in containing its costs. Investors may be better off waiting to see the FY 2019 Q4 results rather than investing at these valuation levels. The company should be announcing its full year and Q4 2019 earnings in May. Advanced Drainage Systems saw a 6% growth in sales in its core domestic construction market. The company saw double-digit growth at key products such as HP pipe, StormTech retention, detention systems, Nyloplast Catch basins and in their water quality product lines. Both residential and nonresidential end markets showed strength. Sales to the residential sector was up 12% in the third quarter and the new residential housing was up a very strong 15%. The company also saw retail sales increase by 8% in the third quarter. The company's infrastructure sales were down 9% in the third quarter. Sales to the infrastructure segment lean heavily on the Midwest and the Northeast and funding for projects in those areas have been weak. Infrastructure sales in Colorado and Nevada had more than doubled in the quarter. North Carolina, Utah, and Florida were doing well in this sector. Total sales increased by double-digits in Florida and Texas. Florida, Texas, North Carolina, Nevada, and Colorado are seeing good population growth compared to states like New York or California. 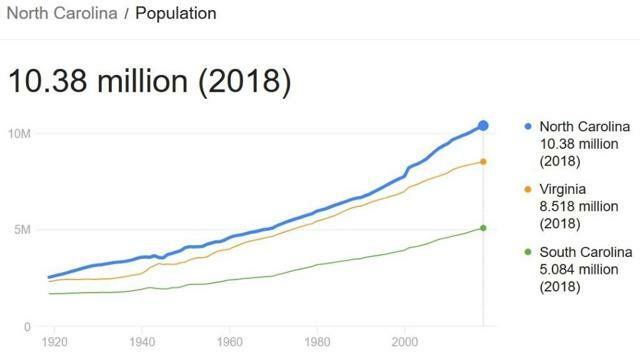 California saw its population increase from 36.19 million in 2007 (before the great recession) to 39.56 million in 2018. That's a population growth of about 9.3%. 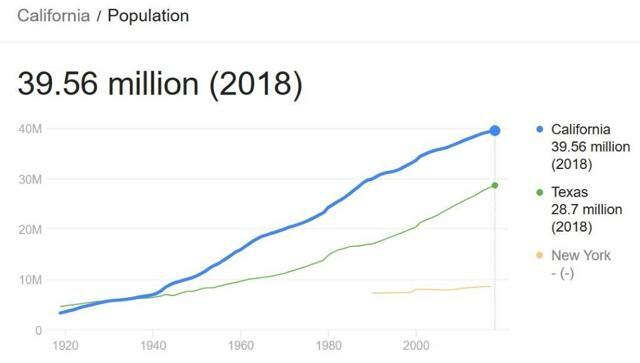 In comparison, Texas saw its population grow from 23.82 million in 2007 to 28.7 million in 2018. That's a population growth of 20.48%. That's more than double the growth rate of California. New York's population in 2007 was 7.9 million and its population in 2017 was 8.6 million. That equates to population growth of about 8.8% over that period. Nevada and Utah, another high growth market for the company have similarly seen dramatic population growth. In 2007, Nevada's population was 2.56 million. In 2018, that state's population was 3.03 million. That's an increase of about 18.3%. 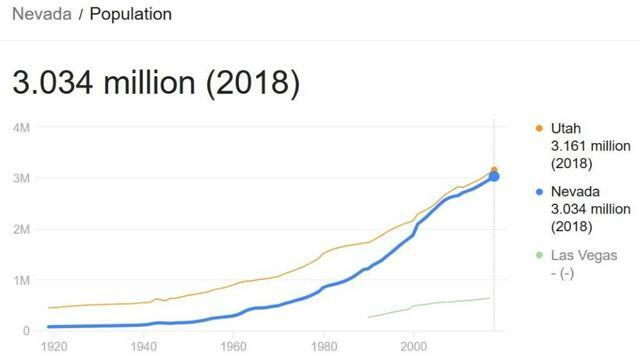 Similarly, Utah saw its population grow from 2.66 million in 2007 to 3.16 million in 2018. That's about an 18.7% increase in population over that period. States like Nevada, Florida, Utah, and North Carolina have low state taxes and lower housing costs compared to states like California or New York. Nevada, Texas, and Florida have a 0% state tax rate on individual income. Utah has a flat state income tax rate of 4.95%. North Carolina had a flat state income tax rate of 5.499%. In comparison, California has a state income tax rate of between 1% and 12.3% and New York had a state income tax rate of 4% to 8.82%. The 2017 Trump Administration tax changes have capped the deduction of state and local taxes from Federal Income tax at $10,000. This change may speed-up the process of more affluent people leaving the high tax states such as California and New York and settling in low tax states such as Florida and Texas. It's not a surprise that the company is seeing double-digit growth in Texas and Florida. This trend could be here to stay for the next decade or more as more people move to lower tax rate states. The companies playing in the U.S. housing sector may see vast beneficial changes in some states like Florida or North Carolina and face challenges in states like California or New York. A recession or a stark slowdown in economic growth may end-up causing greater outflows of people from high-tax states like California and into low-tax states like Texas, Utah, and North Carolina. The agriculture sector was a drag on sales growth. The company thinks the heavy precipitation and cooler average temperatures negatively impacted the fall selling season in the Midwest. The company is working on improving the marketing of its products to the agricultural sector and working on new products and improving existing products. The Canadian agriculture market faced the same weather challenges. The agriculture sector was the biggest drag on sales. In the third quarter, net sales increased by just 1% because of the decline in the agricultural market. The company saw its sales to the agriculture market in the US decrease by 30%. Adjusted EBITDA margin dropped from 17.5% in Q3 FY 2018 to 15.2% in Q3 FY 2019. The biggest drag on adjusted EBITDA was volume, manufacturing and transportation costs. 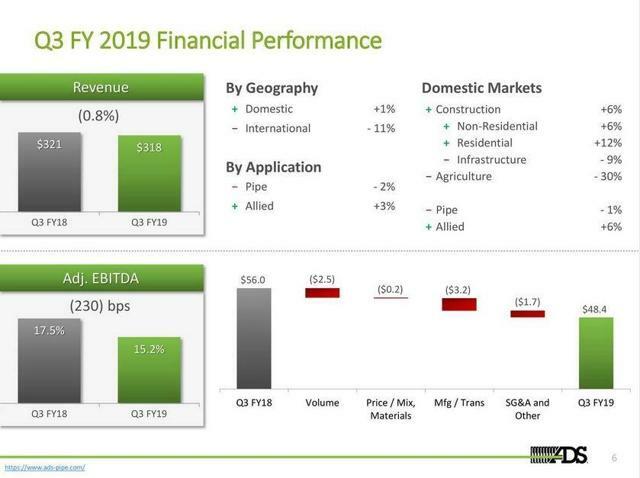 For the full fiscal year 2019, the company expects an adjusted EBITDA margin of 16.4% to 16.8% ($225 million to $240 million) to an increase of revenue of between $1.37 billion and $1.42 billion. In the fourth quarter, the company expects that it would benefit from volume having shifted into January and February. It sees margin improvement driven by higher efficiency in manufacturing and transportation. The company intends to maintain its price at a current level to offset increased cost from material inflation. Even if volumes have shifted to the fourth quarter, would the growth in volumes be big enough to offset the increased costs in manufacturing and transportation? Transportation costs have been especially inflationary and stubborn to overcome. That trend in increased transportation costs may continue in 2019. The company is seeing that the prices for polypropylene and polyethylene have been coming down after the third quarter. The company thinks that the increased transportation costs that caused a $4 million to $5 million headwind year-to-date may not be present in the fourth quarter. The company is dependent on seeing volume rebound and if that does not happen, that may put profits under pressure. Its volume needs to grow while transportation and manufacturing costs should be kept in check. Advanced Drainage Systems is fully valued at current levels with a valuation of 21 [ttm]. At this valuation level, everything must go right for the company for it to achieve its targets and justify its valuation.